So you know that there’s fresh sockeye salmon for sale, you figure it’s time to buy some…and then what? How do you choose it? Prepare it? Store it? It’s best to get your advice from an expert. 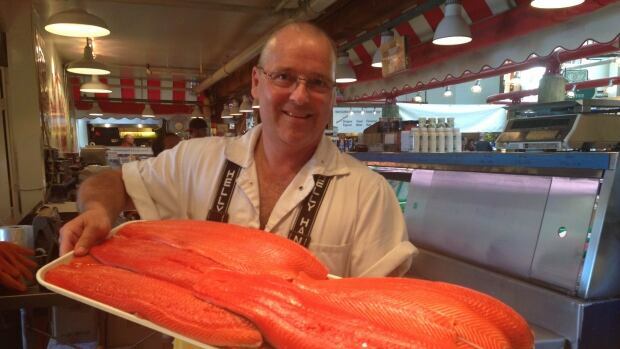 Scott Moorehead of Granville Island’s Longliner Seafood was recently interviewed on CBC Radio One’s The Early Edition and here are his top 10 tips, as featured on CBC British Columbia. 1. Shop with your eyes, nose and touch. Look for firm flesh and shiny skin. The insides should be clean (don’t buy fish with the guts in, as it will spoil faster) and the skin unbroken. Beware of any “fishy” smells. 2. Keep it simple when cooking. Fresh sockeye has a distinct flavour, and doesn’t need much fussing in the kitchen, says Moorehead. Moorehead says the oven’s even temperature makes it an ideal way to cook fish, but with warmer weather the barbecue beckons. 4. Don’t be a cold fish (cooker). Moorehead recommend letting fish come to room temperature first. 5. To flip or not to flip? If you’re cooking a fillet on the grill, there’s no need to flip your fish. Lay it skin side down on an oiled grill, close the lid, and keep the temperature even and not too hot. Foil is a great insulator, but it will also steam your fish. If you choose to use foil, Moorehead recommends leaving a top vent to let the steam escape. 7. Cook for 10 minutes per inch (or less). He uses a guideline of 10 minutes per inch of fish. 8. Freeze what you’ll need for a meal. Cut fish into the portions you’ll need for a meal. “If you freeze a whole fish, you’ll have to use the whole fish at one time,” cautions Moorehead. Freeze family size portions, wrapped tightly to keep the air out, and stored in the darkest, coldest part of your freezer. 9. Freeze only what you can eat in the next few months. Moorehead warns again freezing large amounts of fish for the year, especially if you’re storing it in a freezer that’s opened frequently. Fluctuations in light and temperature will begin to degrade the fish quality. Later in the year, he recommends buying fish that’s been commercial frozen and stored. 10. Eat it fresh while it lasts. “It’s available now and the season’s short, so get out there,” says Moorehead.